Wolfgang Deep Gloss Spritz Sealant Refill 128 oz. Free Bonus! Home > Shop By Brand > Wolfgang Concours-Series Car Care > Wolfgang Deep Gloss Spritz Sealant Refill 128 oz. Free Bonus! For a limited time, Receive a FREE 12 oz. refillable bottle with your purchase of the gallon size of Wolfgang Deep Gloss Spritz Sealant! Now there is no need purchase a separate bottle, just to use your favorite Wolfgang Product! Our super polymer spray paint sealant is back! Wolfgang Deep Gloss Spritz Sealant is a true polymer paint sealant spray that protects and shines in one quick step. Liquid crystalline polymers coat the paint in incredible gloss and protection – just like a conventional sealant. Yet, Wolfgang Deep Gloss Spritz Sealant takes just minutes to apply. Give your vehicle a spritz of shine with Wolfgang Deep Gloss Spritz Sealant. This spray-on sealant is a revolution in paint protection! Wolfgang Deep Gloss Spritz Sealant is a direct descendant of our ground-breaking wipe-on sealant, Wolfgang Deep Gloss Paint Sealant. The two share virtually the same blueprint, with one exception. Deep Gloss Spritz Sealant has engineered liquefied polymers that disperse easily through the spray nozzle and then cross-link on the paint surface to form one solid polymer coat over the paint finish. Wolfgang Deep Gloss Spritz Sealant’s slick coating shields the paint from UV rays, airborne pollution, and road grime. Its incredible slickness allows dirt and water to just roll off when you wash your vehicle. The paint stays cleaner longer, with fewer water spots. The multi-tiered, crystalline polymer structure of the sealant allows it to create a vivid, multi-dimensional shine that far exceeds the capabilities of ordinary sealants. The shine is comparable to what you get from a carnauba wax. Now that’s shiny! And if water-beading is the true test of a quality sealant, then Deep Gloss Spritz Sealant is a proven winner! Wolfgang’s exclusive formula is water-based, which is safe for the paint and safe for you. Many sealants rely on petroleum-based solvents that cause long-term damage to the paint and emit harmful fumes during application. Wolfgang Deep Gloss Spritz Sealant is safe on paint and clear coat, and it’s VOC compliant. Apply Wolfgang Deep Gloss Spritz Sealant as the LSP (last step product) or use it as a wax booster. Wolfgang Deep Gloss Spritz Sealant maintains the gloss and protection of Wolfgang Füzion Wax. Tech note: Wolfgang Deep Gloss Spritz Sealant is oxygen-activated. Once it is applied to the paint, it requires oxygen to bond to the paint surface. Exposure to water will “drown” the sealant, preventing it from achieving its full potential. Wolfgang Deep Gloss Spritz Sealant will offer the maximum shine and protection if allowed to cure for a full 12 hours in absolutely dry conditions. We recommend applying the sealant in the late afternoon and letting it cure overnight. Once cured, the sealant will deliver outstanding slickness, gloss, and protection for months! Detailer Tips: While Wolfgang Deep Gloss Spritz Sealant is an excellent stand-alone sealant, an off-label application is to use it as a quick detailer. Off-label refers to using a product for something other than its recommended purpose. In this case, Wolfgang Deep Gloss Paint Sealant can be used as a super-charged quick detailer to reinforce your existing paint protection. If you really want to kick up the shine on your paint, apply a layer of Wolfgang Füzion Wax over Wolfgang Deep Gloss Spritz Sealant after the sealant has cured. 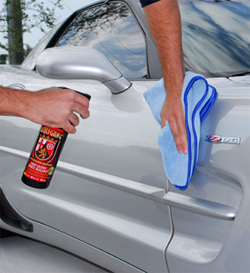 You’ll get the long-lasting protection of the sealant and the warm glow of carnauba. Wolfgang Deep Gloss Spritz Sealant offers the ultimate in shine, slickness, and protection – all in a quick and easy spray formula! Use a dry microfiber towel to buff the section to a glassy shine. Continue in this manner until you’ve applied sealant to the entire vehicle. I use Wolfgang Spritz Sealant as a follow up after Wolfgang Paint Sealer 3.0 has cured on a new application. It will remove finger smudges and any residual product left behind. In between details, I use this product after washing a car that was previously treated with Wolfgang Sealer. It acts as a surface booster and makes the paint feel silky smooth again. Good stuff! Works as prescribed. Cleans my wheels and tires . I use it regularly. I've been using Wolfgang products for a few years now. They are top notch products! I've used their Instant Spritz Detailing spray for quick detailing. I now use the Deep Gloss Spray as a replacement for the Instant Spritz. The Deep Gloss doesn't smear like the Instant Spritz does. It dissipates faster too! Plus the more you use the Deep Gloss the better the shine! Very happy with it. My husband is extremely picky about his car care products and he loves this stuff.